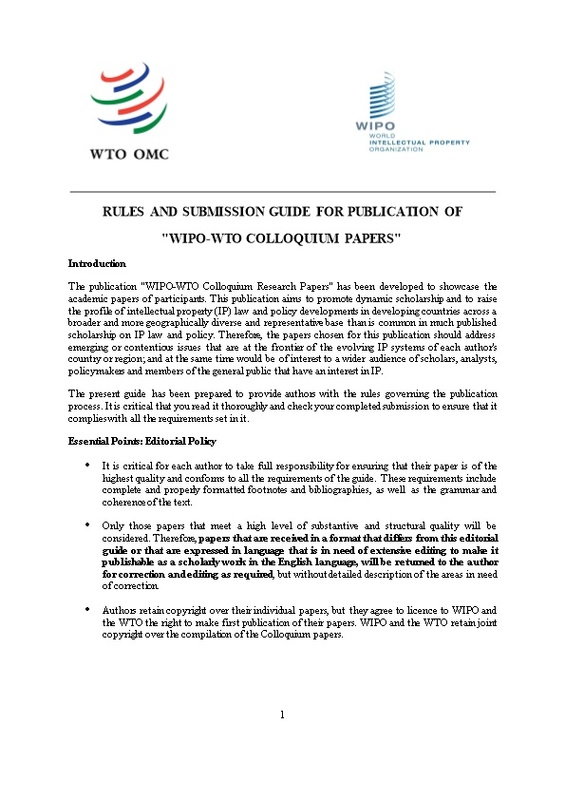 The publication "WIPO-WTO Colloquium Research Papers" has been developed to showcase the academic papers of participants.This publication aims to promotedynamic scholarshipand to raise the profile of intellectual property (IP) law and policy developmentsin developing countries across a broader and more geographically diverse and representative base than is common in much published scholarship on IP law and policy. Therefore, the papers chosen for this publication should address emerging or contentious issues that are at the frontierof the evolving IPsystems ofeach author'scountry or region; and at the same time would be of interest to a wider audience of scholars, analysts, policymakers and members of the general public that have an interest in IP. The present guide has been prepared to provide authors with the rules governing the publication process. It is critical that you read it thoroughly and check your completed submission to ensure that it complies with all the requirements set in it. It is critical for each author to take full responsibility for ensuring that their paper is of the highest quality and conforms to all the requirements of the guide. These requirements include complete and properly formatted footnotes and bibliographies, as well as the grammar and coherence of the text. Only those papers that meet a high levelof substantive and structural quality will be considered. Therefore, papers that are received in a format that differs from this editorial guide or that are expressed in language that is in need of extensive editing to make it publishable as a scholarly work in the English language, will be returned to the author for correction and editing as required, but without detailed description of the areas in need of correction. Authors retain copyright over their individual papers, but they agree to licence to WIPO and the WTO the right to make first publication of their papers. WIPO and the WTO retain joint copyright over the compilation of the Colloquium papers. Signed and dated author/publisher agreement. Approximatelytwelve (12) papers will be accepted. This number may be revised upwards or downwards depending on the level of interest and quality of the submissions. To facilitate its role in promoting scholarly outreach, the Colloquium Papers are published in the English language. Papers are expected to be of a linguistic quality appropriate for a scholarly publication. Before submission, it is strongly advised that proposed papers are proof-read by fluent English speakers familiar with legal writing and analysis. Abstract: Each paper must be accompanied by an abstract of no more than 250 words. Keywords: Please include between five to eight keywords immediately beneath your abstract.Please note that the requirement to include keywords does not necessarily mean that the articles in the publication will be included or made available in online databases. Length: 10 pages - 15 pages. Limits do not include the abstract, keywords and bibliography. References are to be included in the Mendelay database, on an account linked to the Colloquium publication. Details will be provided to authors on submission of their drafts. Authors will receive hard copies of the publication. An electronic version in PDF format will also be posted on the WIPO and WTO websites. Papers submitted for the Colloquium publication must not have been published elsewhere. Authors retain copyright in their articles and are free to publish them subsequently, in original or updated form (with attribution to the WIPO-WTO Colloquium Papers). It is acceptable for an author to cite arguments or use extracts from their previous publications. However, this should only be done to provide contextor to bolster the substance of a related point made in the submitted paper. It is also acceptable for authors to submit papers that elaborate subject matter covered in previous publications. Wherever such references are made to previous publications, the author must provide a full citation and attribution to that work. strongly improve the chances of acceptance. These recommendations draw directly on experience with previous papers submitted for publication and highlight some of the key lessons from past dialogue with authors. Keep your sentences as brief as possible. As a general rule, no sentence should be more than three lines long. One idea per sentence: Each sentence should express a single, cohesive idea. Use of paragraphs: Eachparagraph should express only one idea or point. Every change of subject or new idea must be expressed in a new paragraph. Attempt to keep you paragraphs to no more than ten lines in length. A paragraph that is half a page in length is dense and discouraging to a reader. The use of "or", "and", "and/or"): Avoid using the word "or" more than once in a sentence. The excessive use of alternative positions makes it difficult for a reader to retain all these alternatives, while trying to understand the point of a sentence. The same applies for the use of "and" and "and/or", which further increases the complexity of a sentence. Subordinate clauses: Use subordinate clauses carefully and in a logical position, to ensure that sentences flow coherently. E.g. "The government will not implement the new law, though many observers believe otherwise, until the next election is decided". Such clauses tend to break the reader's train of thought. Instead it is better to say, "Though many observers believe otherwise, the government will not implement the new law until the next election is decided". General rule on citation: Every proposition that is not your original idea should be carefully and comprehensively cited. When in doubt, cite. Footnotes and bibliographies: Make sure to include all elements of all references (author name(s), title, date, case numbers etc. as required by the OSCOLA guide). Paper conclusions: Your conclusions should always tie together and summarize all the points raised in the paper. In particular, make sure your conclusion is consistent with the argument or premise you set out to tackle in your abstract and introduction. Sub-headings and paper sections: Make sure that every section of your paper deals with a subject set out in your introduction. This will help you avoid drifting into other topicsthat are not central to the primary topic that was introduced at the beginning of the paper. The use of special terms: When you introduce a term of art, specific policy, programme or legislation that the average reader is unfamiliar with, please provide a brief description and explanation in thecontext of your paper. Though readers may be familiar with general intellectual property terms, they may not be familiarwith the content or implications of "Regulation 345 of the CFTT". Such a law must be stated in full and briefly explained the first time it is mentioned. Comparisons: Avoid comparingconcepts, approaches and entities in different terms. E.g. Cars have four wheels, whereas bicycles are made of metal. Instead, you must make the comparison on the same basis. E.g. Cars have four wheels; bicycles have two. Though these examples are simple, comparisons made on different bases can be very difficult to understand. This is especially the case when dealingwith complex, unfamiliar or highly similar concepts that require precision in order to make a distinction. Use of extracts from the author's works published elsewhere: Verbatim extracts from the author's own previous worksmust be minimized.Paraphrasing is better than the use of verbatim extracts.Include the original publication in yourcitations and bibliography. Narrative voice: Authors should avoid constant references to themselvesin the first person. E.g. "I think the law should be amended" or "In the author's opinion, the law should be amended." The occasional use of the second phrasing may be appropriate for emphasizing key points. However, it is generally better to useanimpersonal voice. E.g. "The law should be amended". It is clear from such a phrasing that the stated opinion is that of the author without frequent statements that this is the case. Use of online language translation software: Avoid using online translation software such as Google Translator to produce text for inclusion in a paper for submission. Such programs can provide inaccurate and confusing meanings, especially when dealing with legal concepts which do not readily translate when contextcan be critically important. In the unlikely event that you need to use such tools in a limited way, please keep your sentences and phrases brief and ensure that they are checked by a colleague who is fluent in written English.